The Galaxy J7 (2016) launched with Android Marshmallow in April last year is getting Android Nougat now in India. This OS upgrade is of the OTA variety which should appear soon on users notification tabs. The firmware with a size of 1.03 GB was uploaded on Sammobile’s database too ahead of the OTA push. But it wasn’t getting installed on the J7 (2016) for some reason, users reported. If you guys can’t wait for the OTA to arrive, they should have a new one on their servers soon. You can keep a tab of their database to get the info. 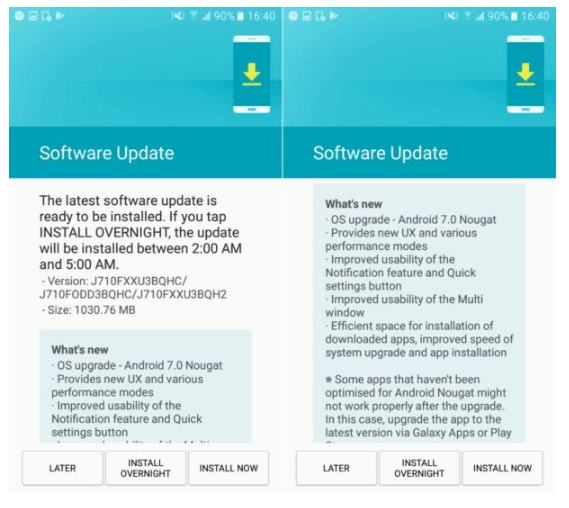 Android 7.0 Nougat after such a long time on the J7 will be a very appreciated update for these users as it will refresh the old device in terms of UX, performance, and stability. Most of all Android Nougat will bring multi-window mode, better notifications, quick settings menu as well as a Doze mode that should help elongate battery life. There will be other changes under the surface that will oil up the software and make it smooth as new. Also, if you don’t receive the update you can manually head to the Settings Menu – About – and select download update manually. As always, don’t forget to take a backup of your current data, charge up your phone sufficiently. Also hook on to a devoted & loyal WiFi so everything goes well. Enjoy Nougat goodies.